We’d love your help. Let us know what’s wrong with this preview of Disunity in Christ by Christena Cleveland. Despite Jesus' prayer that all Christians "be one," divisions have been epidemic in the body of Christ from the beginning to the present. We cluster in theological groups, gender groups, age groups, ethnic groups, educational and economic groups. We criticize freely those who disagree with us, don't look like us, don't act like us and don't even like what we like. Though w Despite Jesus' prayer that all Christians "be one," divisions have been epidemic in the body of Christ from the beginning to the present. We cluster in theological groups, gender groups, age groups, ethnic groups, educational and economic groups. We criticize freely those who disagree with us, don't look like us, don't act like us and don't even like what we like. Though we may think we know why this happens, Christena Cleveland says we probably don't. In this eye-opening book, learn the hidden reasons behind conflict and divisions. To ask other readers questions about Disunity in Christ, please sign up. Have you read ONE: Unfolding God's Eternal Purpose From House To House? It looks at the same problem from a different angle. This should be required reading. The trick is to focus on the ways YOU contribute to disunity in the church, instead of coming up with a list of other people who really should read it. We're all guilty of othering but we don't have to stay there. Cleveland offers personal stories, research, and well-reasoned theology to back up her points. She lovingly urges us to remove our blinders and become part of the solution to the division and vitriol that seems to be growing worse each year. Writing from the perspective of the social psychologist, who also happens to be a woman and person of color, Christena Cleveland, addresses the problem of disunity within the body of Christ. While most ecumenical conversations focus on doctrine and polity, seeking to find pathways to unity amongst our diversity of church practices and theologies, Cleveland focuses on cultural and ethnic diversity and the dangers of homogeneity. It is a very good book, raising important questions and suggesting wa Writing from the perspective of the social psychologist, who also happens to be a woman and person of color, Christena Cleveland, addresses the problem of disunity within the body of Christ. While most ecumenical conversations focus on doctrine and polity, seeking to find pathways to unity amongst our diversity of church practices and theologies, Cleveland focuses on cultural and ethnic diversity and the dangers of homogeneity. It is a very good book, raising important questions and suggesting ways in which the gap can be bridged. Most of the suggested solutions focus on building relationships and common identities that bridge our diversity. She does, however, rightfully dispel the idea that "color-blindness" is the answer. Color-blindness rather than helping build bridges by eliminating cultural and ethnic differences fosters them by ignoring or missing those places where privilege suppresses minorities in the name of unity. Being more open and frank about our cultural differences can provide the opportunity to forge a common identity that includes those differences. Writing as an evangelical Christian, Cleveland suggests that the key is to forge a common identity in Christ. We are, one body in Christ. I found this book a mixed bag. On one hand, it presents many fascinating and thought-provoking arguments on our propensity, as humans, to band together with people who are like us and exclude those who aren't like us, prejudiced against everything about them often simply because of their skin colour, beliefs, cultural background, or the simple fact that they disagree with us. While this was presented with a great deal of evidence and in a convincing manner, I found that the case was almost overst I found this book a mixed bag. On one hand, it presents many fascinating and thought-provoking arguments on our propensity, as humans, to band together with people who are like us and exclude those who aren't like us, prejudiced against everything about them often simply because of their skin colour, beliefs, cultural background, or the simple fact that they disagree with us. While this was presented with a great deal of evidence and in a convincing manner, I found that the case was almost overstated. I wish the author had spent a little less time establishing it and more on explaining how to overcome this tendency. However, it's still a worthwhile and eye-opening read. Some good information here, and it was a good jumping off point for discussion in our small group. But the author appears to be a better researcher than writer. Very repetitive, and a bit dry at times, but worth reading. For those looking to build sociological literacy but have no idea where to search or are too intimidated by dense articles, go here; Cleveland curates well. This is an audience-centered read, especially if the audience is new to formal learning on the sociological dynamics of contemporary Christian communities. For that audience, this is a thoroughly accessible and readable intro. It is accessible because it establishes a sociological foundation via basic vocabulary, categories, and studies. It For those looking to build sociological literacy but have no idea where to search or are too intimidated by dense articles, go here; Cleveland curates well. This is an audience-centered read, especially if the audience is new to formal learning on the sociological dynamics of contemporary Christian communities. For that audience, this is a thoroughly accessible and readable intro. It is accessible because it establishes a sociological foundation via basic vocabulary, categories, and studies. It is readable because it uses a clear and whimsically-edgy style for story-telling and statistics-citing alike. Even the repetition in latter chapters proves useful for readers that are just beginning to think sociologically. I'm giving this 4.5 stars because it quite was a fantastic read. I want to meet Christena and be friends with her! Her book sheds light on the social, and sometimes clinical, reasons we separate ourselves from others that don't think like us. Because I'm all about psychology I truly appreciated the perspective she gave and her approach to this issue. I wish there'd been a bit more relating to faith and the church, but at the same time I think she addressed it so well that it worked in her favor. I'm giving this 4.5 stars because it quite was a fantastic read. I want to meet Christena and be friends with her! Her book sheds light on the social, and sometimes clinical, reasons we separate ourselves from others that don't think like us. Because I'm all about psychology I truly appreciated the perspective she gave and her approach to this issue. I wish there'd been a bit more relating to faith and the church, but at the same time I think she addressed it so well that it worked in her favor. So very powerful. Every dominant culture church & nonprofit leader should read this. It doesnt just talk about diversity, it gives tools for understanding why true diversity is so counterintuitive & with those practical tools, hope for change feels possible. I'm soooooooo glad I read this! This is an important book that approaches the divides in the church from a psychological standpoint, showing just how prejudice and bias infect our congregations through seemingly benign actions. Dr. Cleveland's insights are a useful and unique addition to the conversation about diversity in the church. She has convicting words for people from both ends of the political and theological spectrum, and I appreciated the thoroughness and thoughtfulness with which she laid out the evidence. This book gave me new categories for explaining ingroups and outgroups. I have often felt distant from "other" Christians and didn't recognize my own biases and tendencies to have a us/then distinction. Cleveland paints a hard but rewarding picture of what until will take and actually looks like. I hope I can begin to step outside my comfort zone and take her words to heart. It was good. Helpful. Honest. Laugh out loud Funny at points. I learned a lot and it put my mind at ease that I don't have to find people exactly like me to be happy. In times of broad church conflict, returning to Jesus' command to love one another seems right. I've been dwelling on what holds us together. That and Paul's frequent, overflowing descriptions of the unity of the body. 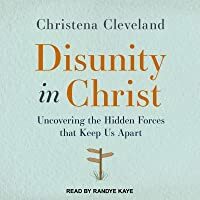 A friend recommended Christena Cleveland's Disunity in Christ to help me think through what drives us to break that unity. I'm glad I read it, and I walk away with my understanding of group identity dynamics confirmed and even strengthened. Cleveland opens DIC with a cleverly writte In times of broad church conflict, returning to Jesus' command to love one another seems right. I've been dwelling on what holds us together. That and Paul's frequent, overflowing descriptions of the unity of the body. Cleveland opens DIC with a cleverly written chapter. Unfortunately the quality of writing declines in the middle of the book. DIC references many social psychology studies (with the strangest endnote citation format I've ever encountered!). These kind of studies make clever writing difficult, and Cleveland's writing in these chs reflects this challenge. It's readable and understandable, but not delightful. The very best part of DIC is the penultimate ch. Building on all of the social psychology of the chs 2-8, Cleveland offers strategic how-to instruction for overcoming the forces that drive us apart. The book is worth the read if only for ch 9. I read this for the Red Couch Book Club, although too slowly/late to participate in discussions (as usual). If you're at all interested in creating real unity within and across the Church, this is a must-read. There is a LOT of academic social psychology in this book, but it's tempered by Christena's great wit and earthiness. I applaud her for addressing important truths that many Christians are too uncomfortable to talk about, and providing practical solutions. If we understand the hidden forces that keep us apart, we can override them to come together, reflecting the body of Christ in its diversity. Completely fascinating. Full disclosure: I received a galley copy of this book free in preparation for an article I am writing from the publisher, IVP Books. In this book, Cleveland takes a broad range of research and theory in social psychology and applies it to the Christian church. She shows why our identity feels so closely tied to our specific denomination, why we shy away from the notion of being a universal church with those who seem different from us (theologically or culturally), and why attempts at crosscultural collaboration (e.g., a predominantly white church and a predominantly black church joining forces) so often go badly. The tone may In this book, Cleveland takes a broad range of research and theory in social psychology and applies it to the Christian church. She shows why our identity feels so closely tied to our specific denomination, why we shy away from the notion of being a universal church with those who seem different from us (theologically or culturally), and why attempts at crosscultural collaboration (e.g., a predominantly white church and a predominantly black church joining forces) so often go badly. The tone may be a little simplistic if you're used to reading a lot of social science research, but her main goal is to bring the wisdom of social psychology to Christians at large, and I think she does that fairly well. Each chapter is followed by a set of reflection questions, and I think they would work well as discussion questions. I'm considering pitching this as a book study for the college residence hall where we live, as I'm sure there are some students who would be interested. I think college students are probably the ideal audience for her messages, because they know enough about research to follow along with her explanations but not enough to already be familiar with some of the more famous experiments (like the Robbers Cave experiment), and many of them (at least at our Catholic university) may go on to be church leaders but aren't yet jaded from failed attempts at certain initiatives. That's my theory, anyway! One thing I particularly liked about this book was that Cleveland explicitly talked about the realities of power dynamics and histories of oppression when talking about crosscultural collaboration. Each time I thought, "Well, that's a nice idea, but it totally ignores the problems of systemic power differences between those groups," she would immediately follow it up with a discussion of that exact issue. I appreciated the section where she talked about self-affirmation exercises and how she as a woman of color could, in effect, armor herself before opening herself up to listening to someone who might have hurtful ideas. She also has some important things to say about leaders modeling inclusive language and behavior before asking their followers to do the same. I had two main critiques of the book: First, Cleveland has a lot of excellent points and examples, but doesn't always string them together in the most effective way. In several cases she introduces a topic, then shares an example that seems only tenuously connected, and then it's only later that she connects the pieces, so it's hard to follow her thought process in the moment, though it all eventually comes together. Second, she speaks at a number of points about comparing "smaller" identities (age, race, gender, etc.) to our "larger" identity of followers of Christ, and how that larger church community represents our ultimate identity through which we can find commonalities among those with different cultural identities or specific theological beliefs. However, there's almost no mention of other religions (except for some research examples involving Jewish people) and it's unclear why all of her examples of crosscultural collaboration couldn't be equally applied to interfaith collaboration. She takes it as a given that all of her readers, while motivated to move past theological differences with other Christians, believe that Christianity is the Only True Faith. I wish Cleveland had included more examples of churches successfully putting her ideas into practice, but I wonder if she felt she needed to put the ideas out there before they could start being used effectively. She has a lot of examples of what hasn't worked well, and examples of advice she's given people, but most of her actual examples of successful crosscultural collaboration are hypothetical. I'd love to know whether, in the five years since this was published, Cleveland's ideas have been applied successfully in actual churches. Big picture, this is a really good book. I loved the examples from sociological research. There was plenty to put into practice. Two complaints. One minor. One major. Minor: The book was a bit repetitive. It boiled down to a few big ideas and could’ve been shorter. Major: She does not explain where we should draw the line between groups. Because sometimes we must. Cleveland’s goal is obviously to promote unity between diverse groups within the body of Christ. Her main idea is to see others as pa Big picture, this is a really good book. I loved the examples from sociological research. There was plenty to put into practice. Cleveland’s goal is obviously to promote unity between diverse groups within the body of Christ. Her main idea is to see others as part of “we” rather than “they.” She gave lots of different examples of the cultural divisions that can be overcome this way, including ethnicity, age, gender, marital status, political viewpoints, etc. This was mostly great, but there were times when she included things in the greater “we” that I thought should be excluded. The main example that came up several times was people who are pro-life and people who are pro-choice. I can understand trying to unite people across viewpoints that are both acceptable under the big umbrella of Christianity. But there are boundaries. A pro-choice person may be a member of the body of Christ (i.e. saved, belonging to God and God’s people), but that doesn’t mean there viewpoint needs to be affirmed as a valid Christian option. It isn’t just a cultural barrier when one person says, “That’s murder,” and another person says it is not. That’s a massive gap in moral understanding with grave consequences. My main point is not about abortion here. That example just highlighted for me the question that I wish she had addressed. How do you know when you must draw lines between groups and/or exclude certain views/behaviors from being acceptable within a group? I’m not talking about being hostile or unkind towards people, but not everyone/everything fits in the “in group.” There is an “out group” somewhere. How do I know who they are? Good, if a tad repetitive. I find most books on cognitive science to be this way, like Thinking Fast and Slow . As mentioned in previous reviews, I like reading about the results of cognitive science studies but dislike reading the actual test set-ups. I think the point that Christena is trying to make in this book is that creating divisions and differentiating between "us" and "them" feel very natural. Maybe too natural...like a sin nature. It is very often the path of least resistance. The aut Good, if a tad repetitive. I find most books on cognitive science to be this way, like Thinking Fast and Slow . As mentioned in previous reviews, I like reading about the results of cognitive science studies but dislike reading the actual test set-ups. I think the point that Christena is trying to make in this book is that creating divisions and differentiating between "us" and "them" feel very natural. Maybe too natural...like a sin nature. It is very often the path of least resistance. The author especially draws attention to the division between Christians in the Church. Especially for me, this issue has been painfully mystifying. Christena gives many examples of how divisions among groups arise and why they are hard to change. I think disunity among Christians can happen for many reasons - theology, historical racism, leadership style, and community building strategies, etc. I think the author makes the point that she believes none of these factors should stop Christians from attempting to unite, but I know many that would disagree with her (especially on the point of theology). I wish she had discussed several scenarios why division and not-agreeing might be a good thing. That would have probably been very disrupting of the theme of unity - balanced certainly, but disruptive. My personal belief is that thoughts on Christianity need to be divided into categories in order of most to least important - core beliefs, doctrines, convictions, and opinions. Each category could be a reason for division in the church. I think the issues among Christians lies in the fact that different topics get placed in different categories; my core belief is something you think is a debatable conviction and vice versa. There is hope, though. A model of a multi-ethnic, inclusive church is Biblical. The Great Commission said to go out to all nations. Jesus himself befriended and loved all types of people. The New Testament discusses the reconciliation of different viewpoints within the Early Church at great length. Christena's book has convinced me that diversity is beautiful and needs to be pursued at individual and organizational levels. I read this book with the hope of learning why disunity is so contagious in the worldwide church. One of my favorite pastors from my church recently left/got fired (who’s to say? ), which made me realize just how many people have come and gone from my church over the past 5 years that I’ve been attending. I’ve also been reading up on racism in order to help diversify my own friend group. This book answered about 75% of my questions, which is a pretty good percentage! Since I was a psychology major I read this book with the hope of learning why disunity is so contagious in the worldwide church. One of my favorite pastors from my church recently left/got fired (who’s to say? ), which made me realize just how many people have come and gone from my church over the past 5 years that I’ve been attending. I’ve also been reading up on racism in order to help diversify my own friend group. This book answered about 75% of my questions, which is a pretty good percentage! Since I was a psychology major, I found this book particularly interesting. She uses lots of great research examples, and lots of social psychology terms I learned about in school. My takeaways are as follows: the us/them language I tend to use that I’d like to eliminate; recognizing my status in society and actively letting that go in order to connect with people from different statuses; acknowledging that if I choose to identify with a group (Christians, for example) I need to share in the glories and the failures; overall humility that I don’t know that much!! I got a little bored half way through, but the discussion questions helped. She did not discuss anything about what to do when you interact with people who are doing terrible things in the name of the gospel. I suppose that’s because everyone defines “terrible things” differently, but nevertheless I did want some practical tips for what to do when I encounter someone who I can see doing literal damage to someone else. Short Review: Most books about unity in the church are either theological or practical peace making types of books. Disunity in Christ has some of those elements, but it has something that no other Christian book on unity that I am aware of has, a good social science background. Disunity in Christ tackles why people have in group and out group feelings and what we should do about it. There is some overlap with Richard Beck's Unclean with regard to the in-group/out-group dichotomy. But Beck's book Short Review: Most books about unity in the church are either theological or practical peace making types of books. Disunity in Christ has some of those elements, but it has something that no other Christian book on unity that I am aware of has, a good social science background. Disunity in Christ tackles why people have in group and out group feelings and what we should do about it. There is some overlap with Richard Beck's Unclean with regard to the in-group/out-group dichotomy. But Beck's book was really just an exploration of that one feature. Disunity in Christ is more focused on what we need to do as Christians about unity within the church, not the primarily evangelistic focus of Beck's book. If I had a complaint it would probably be that Cleveland is too easy on those in majority culture. But that is probably actually a feature of the book, not a complaint. There has to be an entry point to working on unity somewhere. And different Christians are at different points. I think that unity needs to start with adequate self examination and for most in majority culture, that has not happened, so there can't really be unity not because others are resistant, but because majority culture Christians are unaware of their own biases and prejudices and how they push minority Christians away from White Christian institutions and churches. This was another book assigned for a class. I was with it until about the 7th chapter, when it felt like the author took an abrupt turn and never got back to her original point. I was pretty confused by her repeated use of culturally different Christians. What counts as culture? Race? Theological differences? Misongy? Homophobia? Also, all of these books about Christians "just getting along" make pretty strong assumptions that people don't know the "other" group. If we could just meet a conservat This was another book assigned for a class. I was with it until about the 7th chapter, when it felt like the author took an abrupt turn and never got back to her original point. I was pretty confused by her repeated use of culturally different Christians. What counts as culture? Race? Theological differences? Misongy? Homophobia? Also, all of these books about Christians "just getting along" make pretty strong assumptions that people don't know the "other" group. If we could just meet a conservative, we'd certainly like them more. Well, that's not really how it works. Blue dots in red states, we know "them". "They" are our bosses, coworkers, family members. We don't separate from these people because we don't know them, it's because we do. Fabulous and convicting, Cleveland doesn't let anyone get away with thinking that somehow they are better than 'those' people. I'll admit that it is really difficult to read this in the current political situation, and I wonder sometimes if or how she might have written it differently. But perhaps that is the whole point, she would write exactly the same book today, because now more than ever we need to see 'we' instead of 'they.' So, I'm challenged to begin to reframe my thinking as it pertains Fabulous and convicting, Cleveland doesn't let anyone get away with thinking that somehow they are better than 'those' people. I'll admit that it is really difficult to read this in the current political situation, and I wonder sometimes if or how she might have written it differently. But perhaps that is the whole point, she would write exactly the same book today, because now more than ever we need to see 'we' instead of 'they.' So, I'm challenged to begin to reframe my thinking as it pertains to ALL in groups and out groups. Drawing on her expertise in social psychology, this is an incredibly fascinating book in terms of answering the questions about why we do the things we do when it comes to our perceptions of people and groups. But if you hear 'social psychology' and think 'dry and boring,' think again. Cleveland injects just enough wit and humor into her writing to keep things interesting (although personally I think the topic itself is interesting enough). She also offers proven strategies for how we can begin to overcome the differences that divide us, not by 'converting' the other side but by reframing the way we think. "Why I think all my friends are unique but those in other groups are all the same." "Why women think men are judging them more negatively than men actually are, and vise versa." "Why we are so often victims of groupthink and how we can avoid it." In the later chapters she will apply what we learned to why are churches are not multi-culturally diverse. Really excellent primer on how to and how not to pursue cross-cultural relationships, unity, and healing among Christians or, presumably, in any other community. "The homogeneous, culturally isolated church, denomination or organization is not truly participating in the body of Christ. The broken and fragm Really excellent primer on how to and how not to pursue cross-cultural relationships, unity, and healing among Christians or, presumably, in any other community. "Forgiveness is an essential building block for crosscultural relationships, and new, larger identities pave the way for it. Christena Cleveland is a social psychologist with a hopeful passion for reconciling across cultural divisions. She is the first Associate Professor of the Practice of Reconciliation at Duke University’s Divinity School where she is also the faculty director of Duke’s Center for Reconciliation. Christena earned a B.A. from Dartmouth College and a Ph.D. from the University of California, Santa Barba Christena Cleveland is a social psychologist with a hopeful passion for reconciling across cultural divisions. She is the first Associate Professor of the Practice of Reconciliation at Duke University’s Divinity School where she is also the faculty director of Duke’s Center for Reconciliation. Christena earned a B.A. from Dartmouth College and a Ph.D. from the University of California, Santa Barbara. 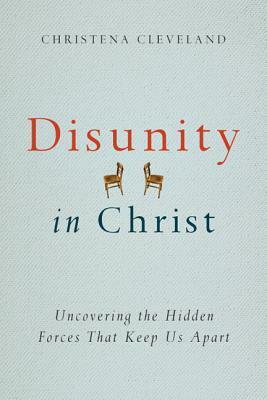 In her book, Disunity in Christ: Uncovering the Hidden Forces that Keep Us Apart (Intervarsity Press, 2013), she examines and offers research-based strategies to overcome the nonconscious cognitive, emotional, and identity processes that pull Christians into homogeneous groups, fuel inaccurate perceptions of culturally-different others, contribute to an “Us vs. Them” mentality, stimulate intergroup prejudice and hostility, and ultimately inhibit reconciliation. The book received a 2013 Leadership Journal Book Award. Christena is currently researching and writing The Priesthood of the Privileged, which investigates power and inequality in the church, and proposes methods for addressing and reducing this equality as a pathway to reconciliation.